Dr. Laura Trice, the CEO of Laura’s WJF based in Venice, California, started baking healthy cookies at a very young age at her Grandmother’s farm in Massachusetts. Laura received her B.A. from Smith College with a double major in Chemistry and French Language & Literature. She received her M.D. from the University of Vermont’s College of Medicine. As a medical student, Laura, who was training at Maine Medical Center in her home town of Portland, Maine, was mentored by Christiane Northrup, M.D., author of Women’s Body’s, Women’s Wisdom. 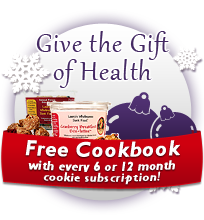 It was in 1993 that Dr. Laura created the original Laura’s Wholesome Junk Food cookie with oats as the whole grain and dates as the primary sweetener. They were so delicious she started baking them on a regular basis. She trained at the Poland Spring Health Institute, assisting in Primary Care, and at Healthy Mother Healthy Baby Midwifery clinic in Nyuh Kuhning, Bali. Dr. Laura also trained in Chicago and up-state New York and received honors in Psychiatry, Endocrinology, Family Practice, Community Medicine and Medical Education. Like every other college student, she loved “junk food.” As a result of coming from a nutritionally conscientious home and having traveled around the world, she tried a variety of diets available looking for what provided her body with the best fuel and used interesting flavors she had tasted while abroad. While in medical school, she saw how people suffered due to illnesses that could have been prevented with better nutrition. Dr. Laura realized that she was just like her patients in that she only ate the food that tasted great to her. She realized that most cookies available seemed to be either good for you (but not taste very good) or they tasted great (but were based in white flour, white sugar and hydrogenated oils). She began creating recipes that tasted as good or better than any treats out there, but used whole grains and whole sweeteners. In 1996, while working on the set of 7th Heaven, Dr. Laura would bring cookies to the set from time to time. Acting as Set Medic, she noticed that when people ate donuts for breakfast, lots of people came to her with headaches several hours later. This did not seem to happen when they ate other foods, including her treats. One day, she noticed that some of the truck drivers on the set were actually eating her cookies for breakfast instead of donuts! This is when she realized that the regular person thought her cookies tasted great! And, that by making something that tasted great and was also good for people, people would make better choices, be able to prevent certain health issues in the future, AND feel better along the way. This passion for healthy and great tasting food led to Laura’s WJF, est. 2001. Her sister, Stefanie, reminded her about the photo of Laura baking and her other sister, Elizabeth, designed the logo and the company was born. As the lead formulator of Laura’s WJF, Dr. Laura is committed to creating flavorful and satisfying food that she is comfortable eating herself and sharing with friends and family while maintaining very high quality standards in every batch. In addition to her love of delicious foods, Dr. Laura utilizes her love of writing and mind/body health knowledge to facilitate writing programs with medical students, private and academic groups on both coasts. Since 2002, Dr. Trice has been affiliated with Promises, a recovery center based in Malibu and West Los Angeles. Due to client response, Writing in Recovery™ can now be found in Promises’ Residential Programs (West Los Angeles & Malibu), Malibu Extended Care, Staff Trainings, and individual referral programs. She was honored by Smith College for her programs. Laura currently resides in Venice, California and enjoys gymnastics (she’s working on handstands, front hand springs and back tucks right now), bicycling, rollerblading and tennis—when she can find the time! She still loves her cookies and gets excited watching them come out of the oven. You can still find her using her 110 pounds to try and turn over a 50 pound bag of coconut at the bakery to make sure they are using the coconut with out chemical additives. She sees feeding her friends and families and feeding your friends and family as a huge responsibility and works to continue to deserve your trust.